SPECIAL OFFERS: $5 OFF a $25 Purchase of Food or Beverage only. Cannot be used towards gift cards. 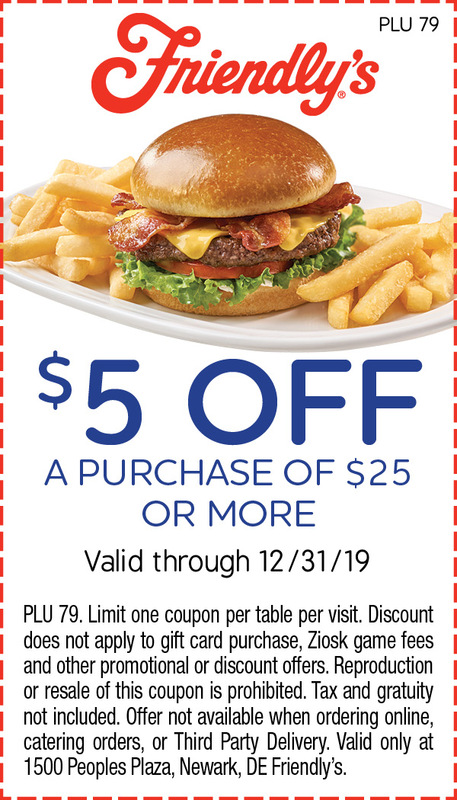 VALID THROUGH 12/31/19... Click for a printable coupon! MORE ABOUT Friendly's: Friendly's-- Where Ice Cream Makes the Meal Friendly's serves signature sandwiches, entrees and ice cream desserts in a friendly, family environment. Located in Peoples Plaza in Newark, Friendly's is a great choice any time of day and serves breakfast, lunch and dinner. For a delicious treat, Friendly's is a great place to relax and enjoy your favorite ice cream dessert. Friendly's features include "Create Your Own Omelettes" for breakfast. For lunch, Friendly's famous SuperMelt sandwiches and burgers are always a hit. Of course, the ice cream is the feature and includes delicious creations such as a strawberry shortcake sundae, Lava Cake Sundae, forbidden fudge brownie sundae, milkshakes, and more. Every member of the family will enjoy a visit to Friendly's. The award-winning Kids Meal includes entree, beverage and ice cream. For seniors, Friendly's offers a delicious selection on the senior menu. FRIENDLY'S COUPON! $5 OFF a $25 Purchase of Food or Beverage only. Cannot be used towards gift cards. VALID THROUGH 12/31/19! PLU 62. Please present coupon to the server when ordering. Not valid for use in conjunction with any other discount or promotional offer. Limit one coupon per party per visit. Unauthorized reproduction or resale of this coupon is prohibited, including on Internet websites. Valid only at 1500 Peoples Plaza, Newark, DE Friendly's. Sales tax applies where required.